And it is also for peplum and I am in love with this style top! 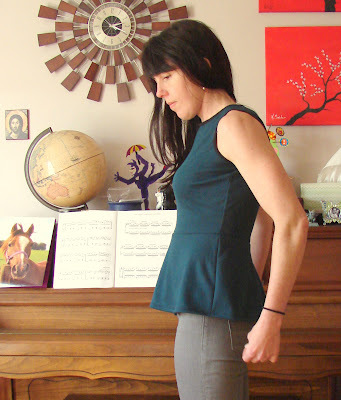 Oh, Peplum, where have you been all my life??? I can't believe it took me this long to make one. I could have been wearing these tops for at least a year now! I think they are just pefect for us inverted triangle shapes - boosts the hips, nips the waist just like I like it. This is the first one I made. The fabric is a ponte knit I bought from Fabric.com ages ago. I like how the peplum forms with this weight of fabric. This is the second version of this top - I first made the peplum with a 3/4 circle skirt but it was too full for me. So I ripped that seam out and re-made the peplum closer to what I had in mind. I kept things simple and finished the neck and arms with black fold-over elastic (stretching just a little as I sewed). I had to add back darts to get the back to fit well in the upper back, but hey! They worked! And the next day I made another one . . . This one is made from a crepe jersey I purchased from GorgeousFabrics.com (yes, it's also the fabric I used in my Garnet Hill knock-off, and yes I might just have enough for one last top). This time I finished the neck with neckline binding using a bias strip of fabric. I extended the bodice on this one and it's a little too long in the back. I should rip and re-stitch, but we'll see. You want to see the pieces with the slash & spread? Yeah, sorry about that. I crumpled them up and tossed them in the trash before I thought about taking a picture. Oh, well! For the elbow-length sleeves I morphed the short sleeve pattern and the long sleeve pattern in the book to get the look/fit I wanted. I can't really describe this process. I just played around with the two pieces, tracing them and re-tracing them until they looked right (ie., looked similar to the Silhouette Pattern #195 sleeves that I often use as a base). I do love this. And I actually own dear Vogue 2960. I just can't see myself actually wearing this to anywhere except tea with the Queen. And as of yet, I haven't been invited. 6 comments on "P is for Perfect"
Yes! So does that mean if I make a full-length ballgown someone will invite me to a ball?! 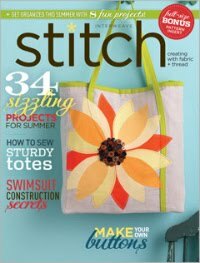 I also love that Vogue pattern - I bought it a few months ago and hope that I actually do make it at some point. Maybe we should organize an afternoon tea at the Drake so we can all make and wear pretty dresses? I love that idea, Gail! I picture a bunch of sewing bloggers strolling into the Drake (and they do have the best tea - went there for a birthday celebration once) to munch on real crumpets. We'd have to practice in advance to avoid soiling our matching gloves . . . This is too much encouragement! Now I'm bound to start dreaming about the perfect fabric . . .